Products in your Showroom are divided into "collections". A collections in your Showroom is the same as a season within your Stitchex account. To allow your buyers to see products on your Showroom, you need to grant access to collections for your buyers - as a whole and also as individuals, if desired. 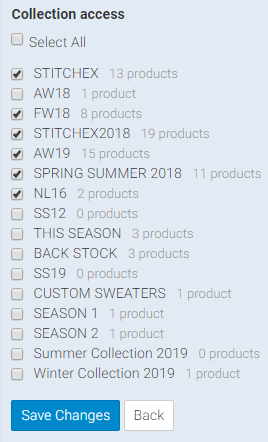 Upload an image to represent each collection in your store and optionally override the collection name (which by default is simply the season name). 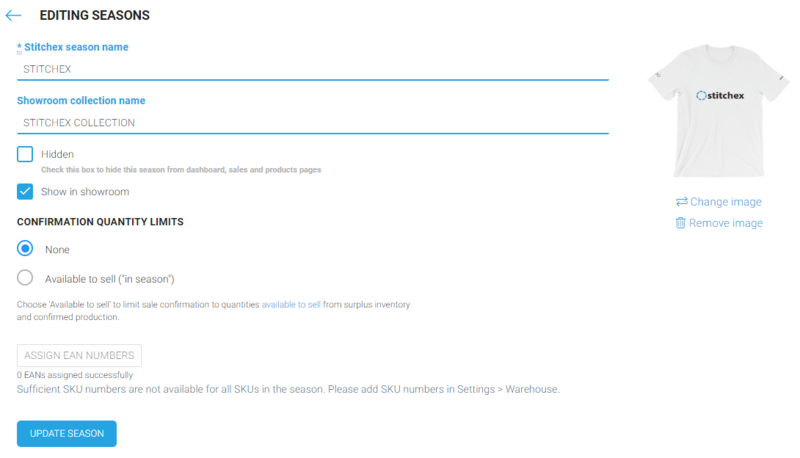 To change the appearance of your products in your Showroom, navigate to Settings>Seasons to view your Stitchex seasons and collections so that you may change their appearance on your Showroom. To learn more about how to associate a Product to a season, see Creating/Editing a New Product. Click on the "lock" icon at the end of the row to access the permissions menu which allows you to manage who has access to that particular collection. You can also control precisely which collections each buyer has access to by editing the settings for the buyer by clicking on the "pencil" at the end of the row (to the left of the lock icon). To enable a season as a collection in your Showroom click the "Show in Showroom" box. By default, all products within this season will be listed as part of the collection in the Showroom. Hidden Seasons will not show up on any of the reports or as a collection for other buyers. In the screenshot below, the Spring Summer 2019 Season was marked as "Hidden" under Seasons so it is no longer available as a Collection available for Showroom Buyer Accounts. HOWEVER, if you have it marked "Show in Showroom" (even if hidden), it will still be visible in the Showroom for Buyers. Navigate to the Showroom/Buyer Accounts page. Locate the specific buyer you would like to customize collection visibility for. Click the "Edit" button next to the specific buyer account. Beneath the "Collection access" section, check the collections that should be visible/accessible. Click the "Save Changes" button to save your changes. In addition, as you retire product variations, their variant colors and prices will fall off of your Showroom display. As an example, the image below shows a product that ranges from $30 to 50 and is available in Black and Pink. Then, go to your Product within Stitchex (not your Showroom) and retire one of those products. The image below shows the retired products with "Reactivate" next to them. If I wanted to "un-retire" them, I would click "Reactivate". The only product not retired is the black one which has the word "retire" next to it. This is a "toggle" to retire or reactivate. Save your work (top, right).